Sign Central’s Full Color Murals. Whether you’re looking to decorate the front foyer of your office or your child’s bedroom, you’ll find perfect, one-of-a-kind wall decals at Sign Central. They add that personalized touch to whatever wall you put them on, making your office a home with fun colors and fresh flavors of self-expression. 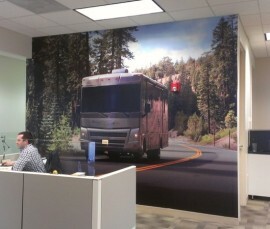 Wall decals are printed on high quality vinyl and laminated for ultimate protection. We print with high quality digital ink so your images always turn out great. When ordering pay close attention to the resolution of your picture, the high the resolution the more crisp your picture is. The ending result will be as life like as the photo you provided us with.